Maybe it was the hubris of scientists who didn’t think that leaving their junk in space would cause issues. I mean, with all that space up there who could blame them? Unfortunately, that junk is going to become a bigger problem real soon if action isn’t taken. The International Space Station had to be shifted last month in order to protect it from a piece of debris smaller than the palm of your hand. The ISS is roughly the size of a football field which you would think would be able to withstand a hit from a 4 inch object, but with the amount of vital systems exposed to outside interference, that one piece of debris, traveling faster than a speeding bullet, could essentially take the whole system down. Scary, huh? And that’s not all. The chance that a launching rocket will collide with space junk is now at about 1% according to experts talking to NewsOK, with roughly 19,000 objects smaller than 4 inches and 500,000 objects between zero and ten centimeters taking up permanent residence in our atmosphere. That’s one out of every 100 launches that has potential to be taken down by a bolt or screw that has gotten left up there. With the prospect of human space flight rearing its head, this is something that could not only cost NASA millions of dollars in equipment, but also many human lives could easily be lost. Get ready to fill your eyes up with planet Earth. 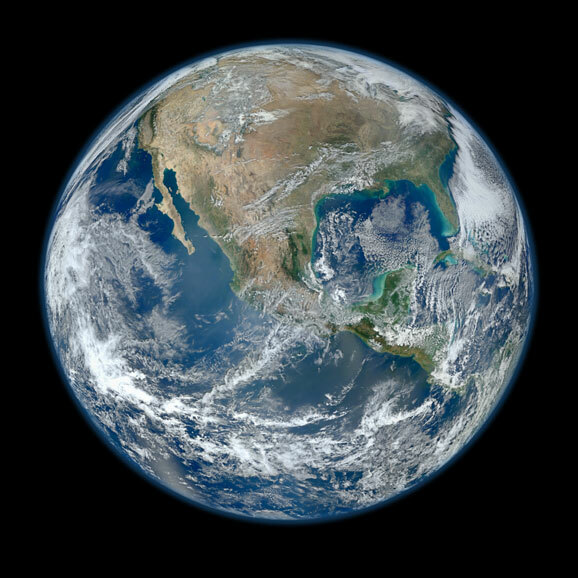 You’ve seen pictures of our little blue marble from space before, but you’ve never seen one taken with this kind of high-definition quality. NASA has released what they say is the highest definition photo ever taken of our planet. The National Weather Service may not sound like the most exciting of government bodies, but some really interesting things fall under their umbrella. Take, for instance, the fact that it is responsible for the Space Weather Prediction Center (SWPC), which “provides real-time monitoring and forecasting of solar and geophysical events which impact satellites, power grids, communications, navigation, and many other technological systems”. The SWPC has been tracking the largest solar storm since 2005, which began after a large solar flare Sunday night and is accompanied by a radiation storm expected to continue at least until tomorrow morning. Solar storms resulting from these kinds of flares come in three stages. Electromagnetic radiation comes first, followed by radiation via protons. We are still in the midst of this radiation storm, which has remained at a classification of S3 (Strong) all day but is expected to peak and start declining soon. This is the highest level from a solar storm in years, but still not enough to prompt astronauts on the International Space Station to take any additional or unusual steps to protect themselves from it. The last and most dramatic part of the solar storm – the Coronal Mass Ejection – will hit Earth at approximately 9am EST. Last week, we heard about Apogee of Fear”, the short film NASA didn’t want you to see. Or, at least, that they wouldn’t give the approval for Richard Garriott to release it to the public. Garriott made the film in 2008, when he undertook his self-financed trip to the International Space Station. Apogee of Fear is officially the first science fiction film both set and actually filmed in space, which makes it kind of a big deal. Even the Smithsonian was reported to have wanted to house the film because of its historical signficance. However, for reasons that were not made very clear, NASA discouraged its release. It seems that the agency has now changed its mind, and you may soon get the chance to see Garriott’s movie. NASA is working with Richard Garriott to facilitate the video’s release. While the project was not part of his original Space Act agreement with NASA, everyone involved had the best of intentions. We hope to resolve the remaining issues expeditiously, and we appreciate Richard’s cooperation and his ongoing efforts to get people excited about the future of space exploration. In 2008, Richard Garriott joined the ranks of a handful of independently-funded “space tourists”. The British-American video game designer raised $30 million to fund his 12-day trip to the International Space Station. His trip is the focus of a new documentary opening today (January 13), “Man on a Mission”. Garriott wasn’t satisfied just to be filmed while on his cosmic journey, though. While on the space station, he realized the fantasy of tons of science fiction nerds: he made a science fiction movie set and filmed in space. Unfortunately, you may never see it because NASA is resisting its public release. Gariott’s eight-minute short film is called “Apogee of Fear” and stars two NASA astronauts and a Russian cosmonaut. Space.com has a run-down of the plot of “Apogee of Fear”: The film opens with Gariott departing the space station and waving to the astronauts, who immediately begin to express how glad they are to get rid of him. They begin to miss him after a bit and start squabbling, but their arguments are interrupted when the cosmonaut announces that they are using oxygen at an unusual rate. The most obvious reason? Aliens. So the crew goes off to search the space station for their stowaway.